So just after the Easter weekend, myself and my husband headed to Bristol airport ready to catch a flight to Inverness. Our aim – to complete the North Coast 500 route in Scotland, a circular route around the Highland coast with stunning scenery. We opted to travel anti-clockwise as we had read that the most stunning scenery was to be enjoyed on the West coast so wanted to save the best for last. Whilst there is a lot written about the route there isn’t much written about where to eat along the way. Myself and my husband enjoyed a lot of food on our trip. Cooked breakfasts every morning as well as regular stops for coffee and cake have not been kind to my waistline although luckily I am in training for the London Moonwalk so a 14 mile walk today has helped burn some of it off! I thought I would recount some of our favourite places that we ate and drank at should you be planning on completing the route yourself or if you are in the local area looking for some foodie inspiration! I first read about Cocoa Mountain on Hannah Gale’s lifestyle blog. Cocoa Mountain has a somewhat lenegdary reputation not only from the luxurious (and delicious) chocolate they produce but also from the fact that the couple that run the business have also featured on the BBC2 show Dragon’s Den. I have to say from looking at Instagram photos of other people’s visits and my love of all things chocolate I was pretty determined that we were going to visit. My husband certainly wouldn’t have heard the end of it if we hadn’t! It is based at Balnakeil Craft Village near Durness on the North coast. The craft village is a collection of unusual buildings which were built in the mid 1950′s as a Ministry of Defence early warning station in the event of nuclear attack. However, it was never commissioned, and in 1964 it became a hub of creativity. As the name suggests Cocoa Mountain offers a range of chocolates, however what I was really interested in was the hot chocolates they offer. They are truly amazing and I can honestly say it was the best hot chocolate I have ever had. It was rich, velvety and topped with melted chocolate. Visually they look stunning as well. We felt it would be rude not to try some chocolates whilst we were there and you can purchase a small tasting dish of 2 chocolates with your hot chocolate. We decided to share and I enjoyed a classic truffle and my husband enjoyed a chocolate flavoured with vanilla and coffee. As to be expected they too were delicious! Should you be passing through Durness Cocoa Mountain is not to be missed! 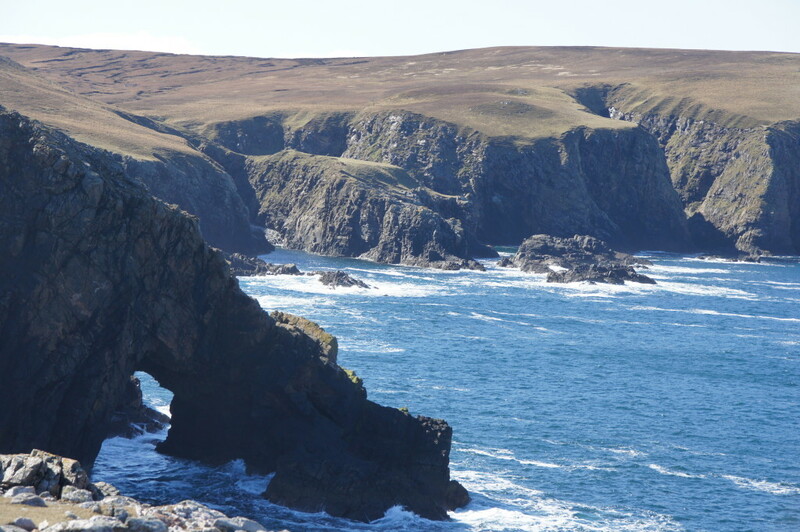 If you’re in Durness you will probably be visiting the Smoo Cave. It is a large combined sea cave and freshwater cave that is accessed by a short walkway. If the weather conditions are good you can also take a short boat tour (a truly interesting experience!) 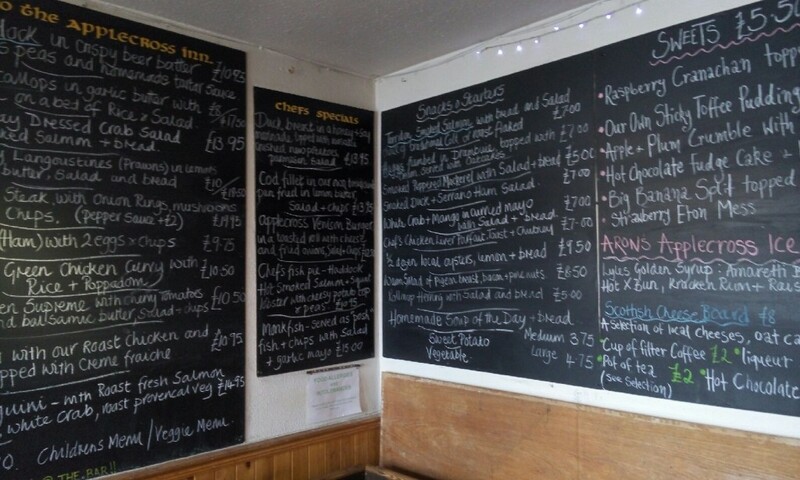 If you’re staying overnight in Durness there aren’t too many places to eat. We opted for the Smoo Cave Hotel based on it’s Trip Advisor reviews and we weren’t disappointed. It has a fire and cosy atmosphere and offers traditional pub food with a Scottish twist. My husband is a big Scotch egg fan so opted for the haggis scotch egg served with a whiskey sauce and traditional neeps and tatties. As this is really a starter he added chips to turn it into a main meal. I had the beef chilli made with Scottish beef which was filling and tasty. For dessert we decided to share the Orkney fudge cheesecake which was definitely homemade and rich and creamy. We would definitely recommend eating there it you are staying in the local area. If you’re feeling brave you can turn off the main roads onto the Drumbeg loop. It is a 24-mile-long single track road that follows the coast from Kylesku to Lochinver that is narrow, twisting and in places very steep. It is one of the routes most scenic roads and you will be rewarded with some fantastic views. Along the route there is a secret tea garden which you can visit although unfortunately for us the weather was not really suitable for us to visit. When you get to the end of the loop you reach the village on Lochinver. On the hunt for lunch we called in to the Lochinver Larder to be greeted by a tantalising selection of pies that you can eat in their restaurant or take away. We opted to take away a pork, chorizo and Manchego cheese pie which we shared four our lunch and also a strawberry and rhubarb pie to keep for another day. They were really tasty and packed full of filling. The pastry was crisp and crumbly and baked to perfection. 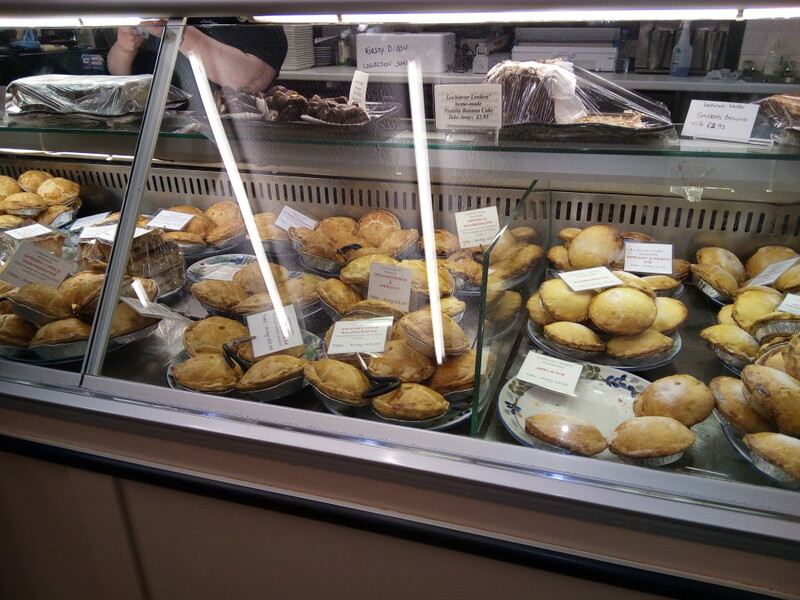 They had a whole host of flavours – we were also tempted by the pear and chocolate and the chicken and ham pies. We decided that whislt we were in Scotland we needed to try some traditional Scottish fish and chips. Rather than cod in Scotland you will find most fish and chip shops serve haddock. Ullapool has two fish and chip shops but after some research it became apparent that Deli-Ca-Sea has the best reputation. 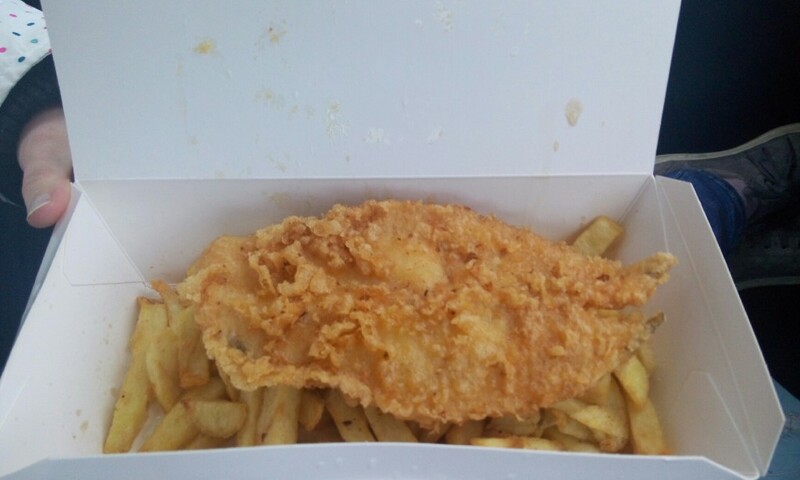 We enjoyed our haddock and chips – the haddock’s batter was incredibly crispy! Gairloch is situated on the West coast and is a small tourist hub offering boat trips looking for seals and even whales! We opted to stay just outside Gairloch in Badachro. If you keep driving along the road you will reach the stunning beach at Redpoint which is well worth a visit. The only place to eat in Badachro is the Badachro Inn but luckily the food is great. It is small and offers seating inside and outside with lovely views across the bay. We sat in the conservatory and enjoyed popping outside to enjoy the sunset. A word of warning though, due its size you would definitely need to book to eat in the summer. There is plenty of fresh local produce on the menu. I opted for local pan fried salmon with a lemon butter, dauphinoise potatoes and salad. It was delicious and didn’t last long! My husband opted for a cheese and bacon burger and again wasn’t disappointed. Should you enjoy gin you can also sample a Rock Rose gin which is a gin produced near Dunnet (which is near John o’ Groats). 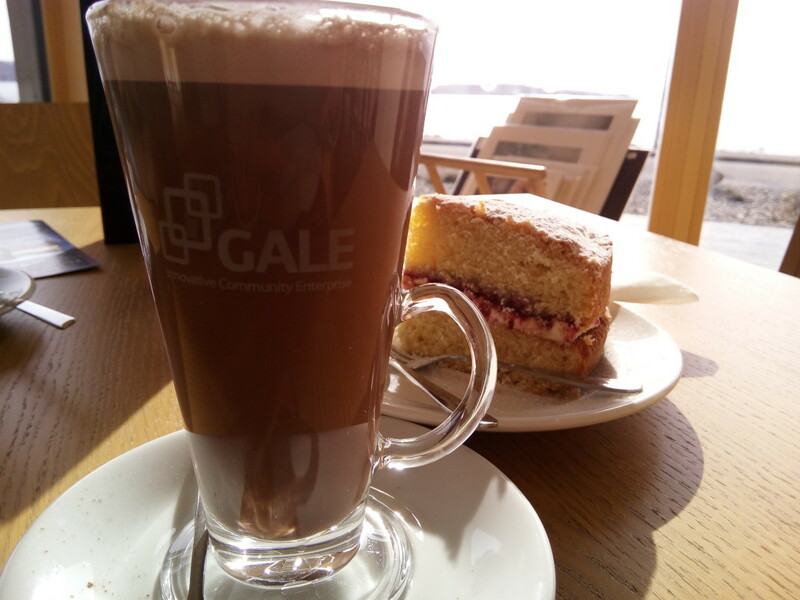 On the outskirts of Gairloch is the Gale Centre. We stopped here as they offer local tourist information and we were looking for a local walk to complete. It is a community centre that offers tourist information but also has a small cafe and sells local produce and other locally made items. After completing our walk around Loch Kernsary we stopped back in our way to our bed and breakfast in Badachro to refuel. They had an eye-watering selection of cake and ethically sourced coffee – we enjoyed a very tasty slice of Victoria sponge. An added bonus are the stunning views across Loch Gairloch. The Applecross Pass (Bealach na Bà) is legendary. When we were at home in Devon over the Easter weekend, Mr Birdie’s grandparents were telling us all about it. It is a historic pass through the mountains of the Applecross peninsula with the greatest ascent of any road climb in the UK, rising from sea level at Applecross to 626 metres and is the third highest road in Scotland. Before setting off, we stopped in Applecross as Mr Birdie had read about the Applecross Inn. It is currently Countryfile’s ‘Pub of the Year’! It has won many other awards. It looks out across the bay and you can enjoy the view if you’re lucky enough to bag a table next to the window. It was a Sunday when we visited and we arrived just before midday and had a quick walk around the village before heading to the pub just after it opened at noon. It was a good job we did as it soon filled up and was full before long. Their menu features many locally sourced ingredients. I enjoyed the Applecross Bay langoustines whilst my husband had the lingune with roast chicken. Outside the pub they have a very trendy food cart/caravan which serves ice cream, fish and chips, coffee and cake. We decided to have an ice cream for dessert – despite the rain! My husband makes a starring appearance in the photo of the caravan! 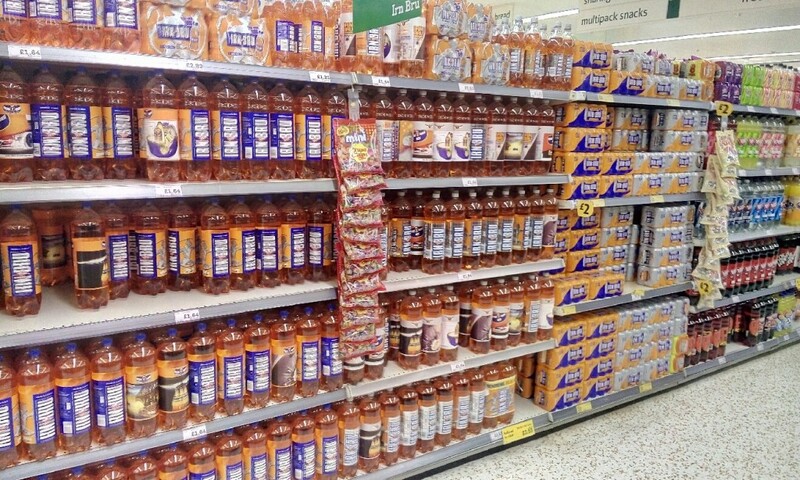 I’ll leave you this photo which we took in Morrisons in Inverness which I found funny – I knew they liked Irn Bru in Scotland but didn’t realise it was quite this popular!